In a forest of green, a burst of yellow flashes by along the marsh. Known as the Prothonotary Warbler, these darling warblers are known for their ‘sweet-sweet-sweet’ call. These beautiful bursts of yellow can be found at Governor’s Bridge Natural Area, breeding along the marshy banks of the lake. Patiently waiting, one lady was flitting under the water lily fronds looking for little midges to dine on. A dreary rainy day with light drizzle provided me an excellent opportunity to introduce flash into my bird photography. Mind you, I’ve got mixed emotions with using flash with birds. First, it’s just an extra piece of equipment that I’ve got to keep track of. The last thing I need to do hit it on a tree branch while walking along. The other is more important to me. I didn’t want to add an element that can create a falseness in my captures. I also have a real issue with disturbing the birds with the bright flash of light. With thanks to Jim Flowers of Birds and Blooms who kindly shared his expertise with flash photography, I decided to take the plunge. Purchasing a Harbor Digital Design Flash Extender to match my flash unit. It installed firmly onto the unit, allowing me confidence that it won’t wobble or fall off like the Better Beamer is frequently known to do. Selecting negative exposure compensation on the flash unit was the next step. Going two stops lower to -2.0 helped the bird’s eyes not get that deer in headlight look. It also gave enough fill to enhance the bird without it looking fake. Using a flash unit limits your shutter speed, so these captures are 1/160th of a second, f/6.3, ISO 500 with a cloudy white balance. 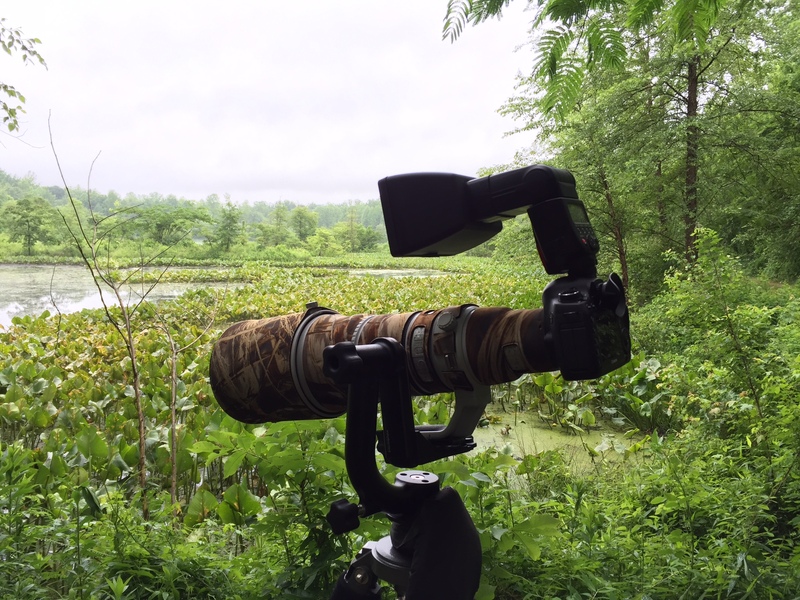 A tripod was essential in capturing in focus images, and of course waiting for the bird to get closer helps even more. Did it disturb the bird? Well, all birds are disturbed with merely your presence, but this one seemed perfectly fine with the flash and no reaction showed me otherwise. Will I use it again? Surely I will. In conditions such as these where warblers are hiding within a tree canopy. And most certainly when I ever get myself to Costa Rica. The photos are great, as always, and the equipment impressive, although it is all lost on me and my ignorance, I am afraid, but I am glad it produced the desired effect. It’s amazing how many different types of birds live around your area. that’s a real privilege. I wish I could schedule Costa Rica. Think hubby may revolt. But I really need to go..and soon! Hey, you can just enjoy the pretty birdies ok Fatima? oh wow the lens! the camera looks so itty bitty compared lol 🙂 amazing shots! Isn’t that the truth ! I think it’s so funny that the camera that really does all the work is so tiny in comparison. Thanks for the thumbs up on the pics. Can I ask you what lens you were using for those photos? This is the Canon 500mm f/4 L II Nelson. Awesome lens! Thanks for all the information. I’ve been considering using a flash for some of my bird photography but have been reluctant to do it for the same reason you stated. I’m going to take the plunge and try it. It’s worth it I think. I also saw a situation today that I would have liked a flash. We’ll see how much I use it with time. Thank you so much ! Indeed, mother nature couldn’t be a better artist. That’s really interesting, I would never have thought to use a flash for bird photos. The real pros use it quite a bit. The trick is to get it right. Just a little bit of fill light to enhance the bird. Not to drown it out. Thanks Mark! Great images and an impressive lens & flash! Thanks Tiny ! Indeed, I love my ‘baby’ lens. My true companion. Me too ! I just need to use it more. I’m at least keeping it in the bag with the camera/lens kit. Maybe..just maybe I’ll pull it out more.